As young children begin to develop early mathematics understanding, two critical skills must be addressed. One is subitizing, the ability to see quantities at a glance without counting. For example, when a die is rolled, most older children and adults can determine the number without having to count individual dots. The second skill is seeing quantities in terms of fives and tens, a skill which not only helps build computational strategies later on, but strengthens understanding of our base ten system through a strong sense of ten. Subitizing is an important prerequisite to counting for young children, and is foundational to understanding part and whole, connecting number words to quantities, and visualizing and using mental images to strategize and solve problems. 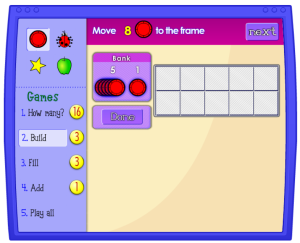 The National Council of Teachers of Mathematics Illuminations website has two excellent games that provide students practice with subitizing, ten frames, and numerals. Ten Frame presents math activities that help students relate numbers to other numbers. which is helpful when thinking about different combinations of numbers. Ten Frame gives students experience with the “anchor” numbers 5 and 10, helps children see numbers in relationship to 5 and 10, and helps students understand ideas like “3 more than 5” or “2 less than 10”. Ten Frame includes four games to practice with ten frames. In “How Many?” students identify the number of chips on a ten frame. In “Build” students build a number using a ten frame. In “Fill” students add the number of additional chips that are needed to fill the frame. And, in “Add” students use ten frames to model addition. Concentration uses the classic matching game to provide children practice matching numeral, dot pattern, and ten frame representations of numbers. Students may play the traditional way, where all choices are covered, or use a modified version where choices are covered by translucent shades. Other matching games are also included. Kate Fanelli is the math accessibility specialist for Michigan’s Integrated Mathematics Initiative (Mi)2, a state of Michigan initiative that promotes and supports high quality mathematics education for ALL students. Follow (Mi)2 on Facebook (www.facebook.com/mi2.page) or on Twitter (MI2_Math). Contact Kate at kate.fanelli@misquared.org. Tagged Concentration, games for learning, Kate Fanelli, MathTech, National Council of Teachers of Mathematics, sets, subitizing, Ten Frame. Bookmark the permalink.